These itineraries are all for one week in southern Norway, but you can find a comprehensive list of all 21 of my Norway itineraries for both the south and north here. 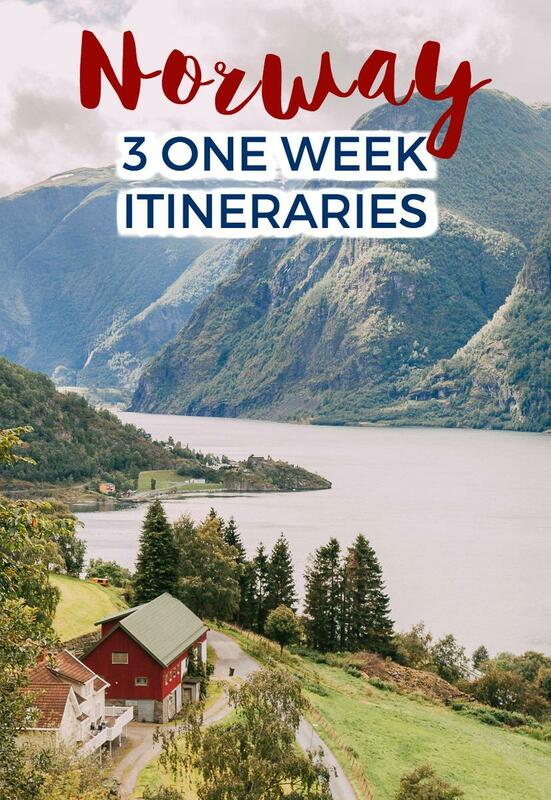 It seems like just about every day I get the same email from visitors to Norway, telling me that they only have one week in Norway and asking what the perfect Norway itinerary for that amount of time would be. Usually, I say something annoyingly vague about how it really depends on how they want to spend their time, as the country is enormous and there are so many different things you could see in Norway in a week. And it’s true! I can think of so many different ways to spend a week in Norway that would make for the best vacation ever. But I also get that all the options can be sort of overwhelming, and sometimes you just want someone in the know to tell you what to do. So that’s what I’m going to do. I’ve been living in Norway for four years, plus I’m a Norwegian citizen and spent every summer and Christmas in Norway while I was growing up. Why am I telling you this? Because I’ve seen so many Norway guides written by people who only ever visited for a week. And while that’s really great, this a an enormous country with loads of hidden gems that only locals know about. And lucky for you I’m spilling my Norway secrets! So I’ve come up with three different Norway itineraries for seeing as much as possible in one week. All of them can be adjusted, so you could probably make a five-day itinerary or 10-day itinerary from these as well – or you could combine them for a two-week itinerary. Lots of options here! And if you need even more inspiration for your Norway trip, I’ve also compiled a huge list of over fifty things to do in Norway here (which I continue to add to with local recommendations). The first itinerary really does require a car, the second is best as a road trip but can also (sort of) be done by public transport with some modifications, and the third solely uses public transport (though you could totally do it by car as well and see a lot more). When it comes to renting a car in Norway, I always recommend using Sixt. 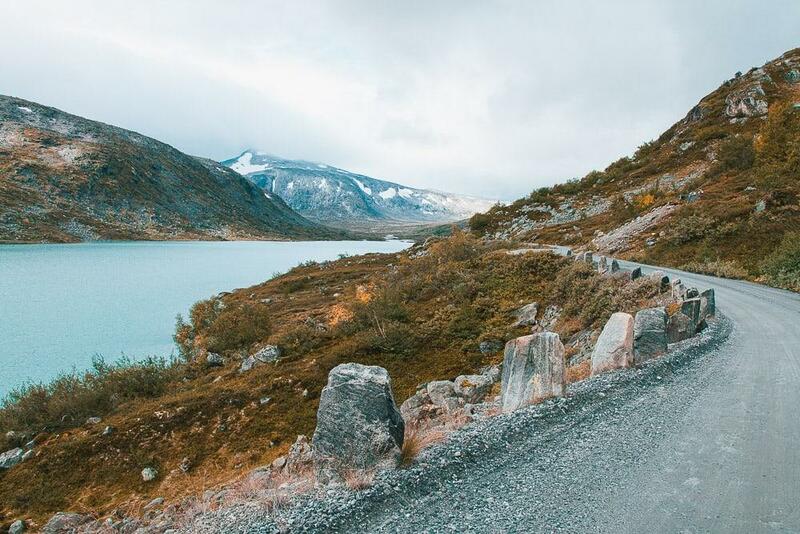 Now, these itineraries are packed and include a lot of driving – they’re designed for people who want to see as much as they possibly can in their short time in Norway. So depending on how much time you want on the road you might need to cut out a day or two and do less each day instead. But I will say that driving in Norway is an experience in itself – you won’t be on any boring highways here, and I’ve made sure to take you along the most scenic routes. Also, I’ve included the most scenic routes here, which often are mountain roads that unfortunately can be closed in the winter. If Google Maps doesn’t want to route you through one of these roads it usually means that the road is closed (but if you’re planning your trip in the winter and want to see the road, just change your departure time to a summer date and it should pop up). I’m calling this one the cultural heritage itinerary because it takes you through several UNESCO World Heritage Sites, historic cities, and there’s even a stop at an old stave church! I feel like this would also be the best itinerary if you’re traveling with a family, as all the places and activities are super family friendly. 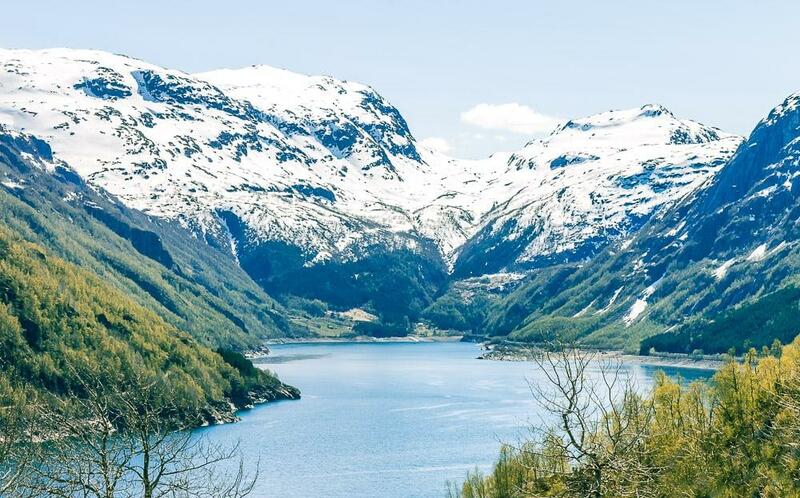 The drive from Oslo to Notodden takes about an hour and 45 minutes, and ideally, you’ll want to leave in the morning so you can fit in more time in Rjukan later in the day. Notodden is an Industrial Heritage Site, where you can see some of the industrial buildings from the early 20th century, including where the workers used to live. Notodden is also home to the Notodden Blues Festival, the largest blues festival in Scandinavia – hence the enormous microphone statue in the center of the city. Though to be honest, there’s not a whole lot to see in Notodden. Like, it’s really interesting to see the town, but you don’t need to spend much time here – once you’ve seen it, you’ve seen it. The main reason you’re here is to see the Heddal Stave Church right outside of town. Built at the start of the 13th century, the Heddal Stave Church is Norway’s largest stave church, and it’s definitely worth a stop for some photos. And then you’re going to turn off onto Fv651 for one of my favorite drives in all of Norway. If the road is closed take Fv361 to Fv37 instead – also a beautiful route! Gaustatoppen is probably my favorite mountain in Norway, and if it’s not too foggy you should be in for some gorgeous views. The drive up here does include some sharp hairpins, but I promise it’s not scary. And it’s one of my favorite drives in all of Norway – the views are so gorgeous. And Rjukan is also an Industrial Heritage Site, as well as simply a really interesting town in a very dramatic landscape. Rjukan has an important WWII history, and while the town is in such a deep valley that it doesn’t get direct sunlight for six months of the year, recently they set up mirrors to reflect sunlight down into the town square – you should definitely check it out! 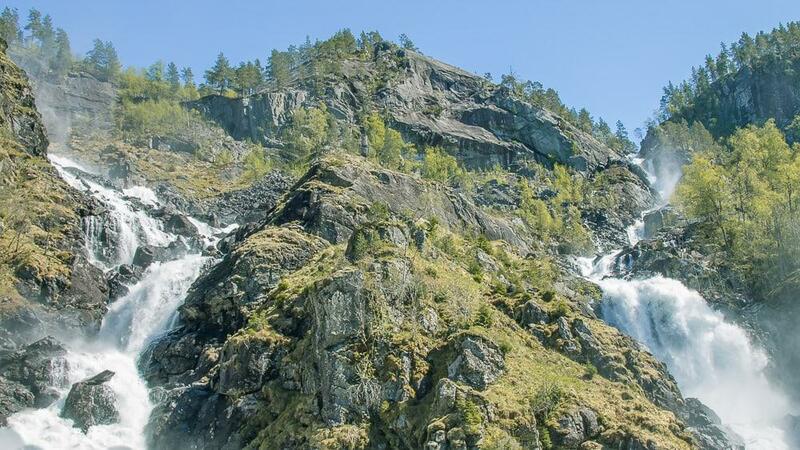 There are also lots of fun activities and sites to visit in Rjukan. I’ve written a complete guide to things to do in Rjukan here. There are also quite a few Airbnb options in Rjukan, such as this idyllic cabin, this charming apartment, and this beautiful chalet. And if this is your first time using Airbnb you can get a discount by signing up here. 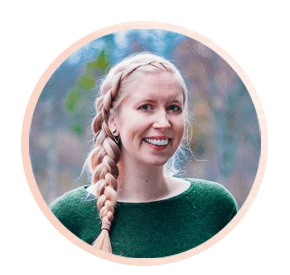 If you’re on a budget, Airbnbs are the way to go in Norway, as they’re not only more affordable, but you’ll save so much money by cooking in your apartment as eating out in Norway is very pricey. The drive today is SO beautiful – like, I’m feeling a little jealous just writing about it because I want to do this drive again and again. Driving from Rjukan to Odda takes just a little over three hours, so if you didn’t have time yesterday you could take a couple of hours in the morning to explore Rjukan a bit more. Then you’re going to start the hair pinned climb up towards Rauland, passing the Vemork Heavy Water Museum on your left as you’re driving out of town. You’ll then drive through Rauland (where I lived for three years! ), and over Haukeli pass before descending towards Odda. Haukeli pass is stunning – if you’re new to Norway you’re really going to be blown away as this sort of landscape is so unique to Norway. You can read more about this drive in this post about driving from Rauland to Hardangerfjord. When you get to Odda I’d recommend driving farther down Hardangerfjord, as it really is so beautiful. If you want to hike Trolltunga you can spend an extra night in Odda, as the starting point for Trolltunga is nearby. 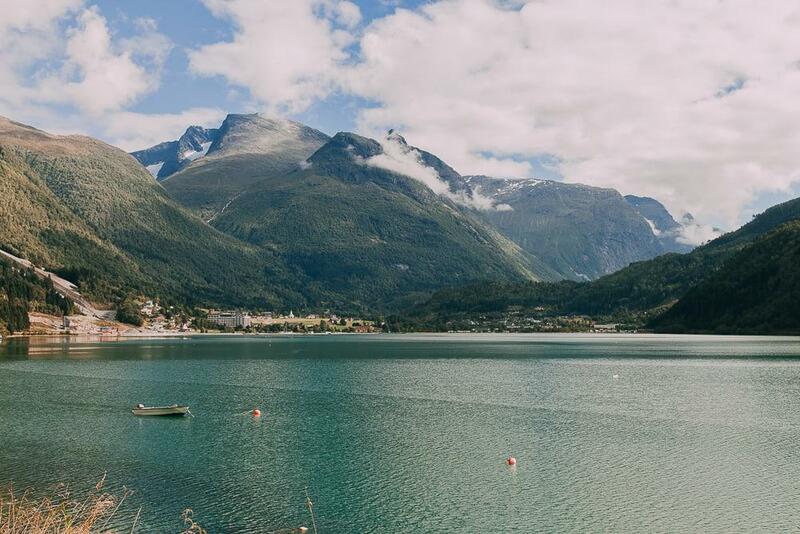 To be honest, Odda doesn’t have great accommodation options (plus hotels in town book up really quickly because Trolltunga is such a popular hike), so I’d recommend staying somewhere along Hardangerfjord instead. Hardangerfjord looks like something straight out of a fairytale – in fact you could happily spend a week just on Hardangerfjord if you wanted to extend your stay here and have a more relaxing vacation. The drive to Bergen is long but beautiful. You will have to take a ferry but don’t worry, they run often and you can pay for your ticket as you drive onto the boat – super easy (and yes, they accept card). I’ve done this journey a lot by bus, and it’s always so exciting when you start getting closer to Bergen! You can find a list of the best accommodation in Bergen for different budgets here, and the best hostels in Bergen here. There are also plenty of Airbnbs in Bergen, like this comfy studio in Danmarksplass, this central basement apartment, or this one near the train station. No driving today! 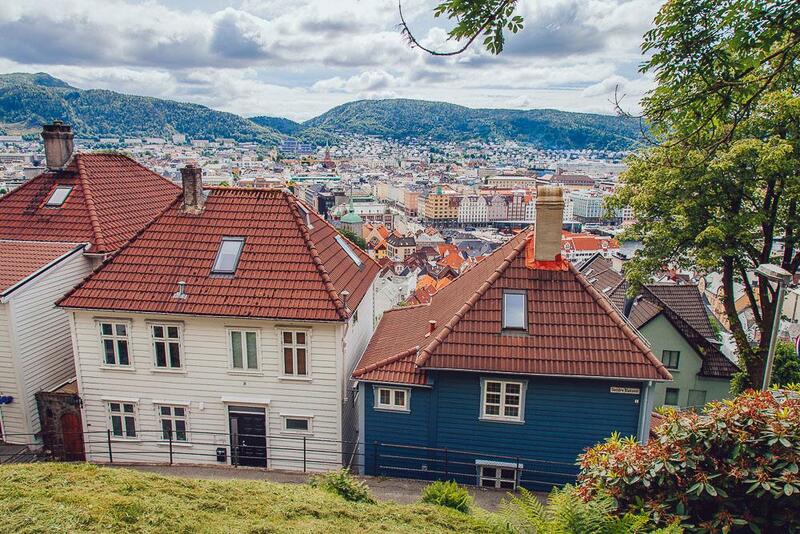 Instead, take the day to explore Bergen. And you are going to love Bergen. It’s easily Norway’s most beautiful city and it’s so loved for a reason. I’ve visited many times in the past few years, and my family loved making trips here when I was growing up as well. I have so many amazing memories from my trips to Bergen and I’m sure you’ll make some too. I’ve written two guides to things to do in Bergen here and here. If you’d like, you can also do some tours around Bergen, like this 2-hour Segway tour, this 3-hour self-guided tour, or this private tour with a local. Or if you want a truly unique experience, check these adventure activity options (like zip-lining and helicopter tours!). Okay, this drive is crazy long and you don’t have to do it all in one day as Day 6 is a much shorter day. However, I’d recommend trying to get as far as possible today because then you’ll have more time to explore the fjords tomorrow. Plus, this will be one of the most spectacular drives of the trip, I promise. 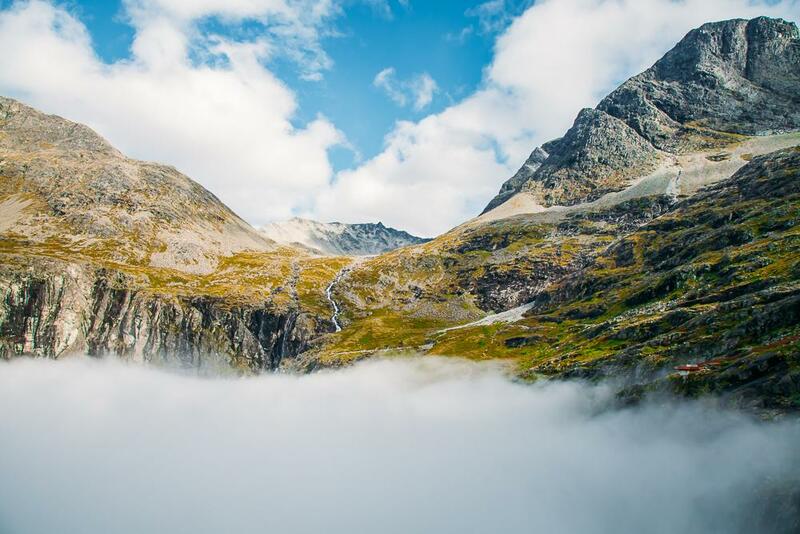 In fact, you’ll be driving along two of Norway’s National Tourist Routes, first over Aurlandsfjellet and then over Sognefjellet from Gaupne to Lom. 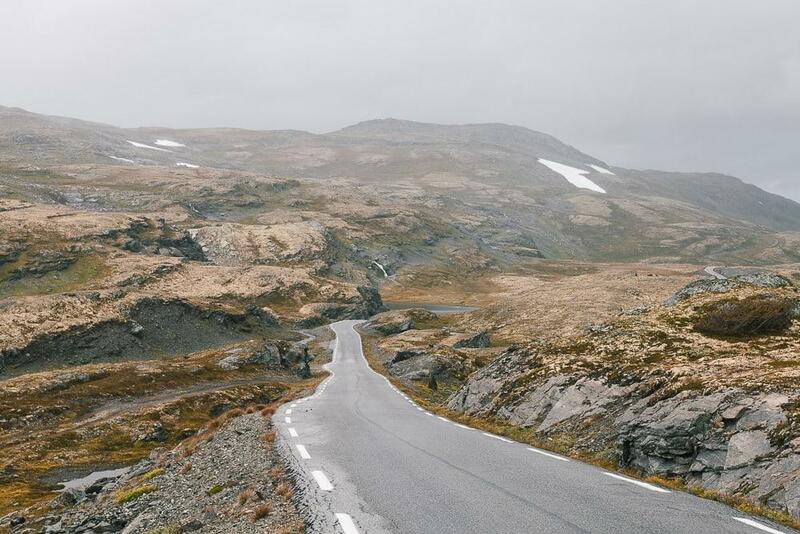 You can read about this drive here: The Prettiest Road Trip from Bergen. You could also break up this day by overnighting somewhere along Sognefjord. Check out options on Airbnb, like this apartment in Aurlandsvangen, this one in Aurland, or this one on the north side of the fjord. See more accommodation options near Sognefjord here. There are quite a few Airbnbs near Lom, like this 2-bed apartment, this cozy cottage, or this charming holiday home. 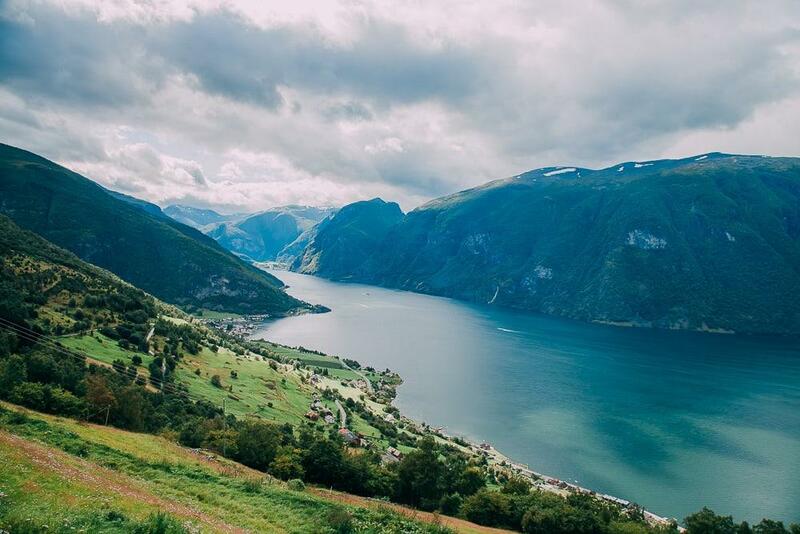 Today you have a much shorter drive to Geirangerfjord, and then you can choose yourself where you want to explore. But on your way, there be sure to take a small detour down Gamle Strynefjellsvegen, another National Tourist Route. I haven’t been able to mark it on the map because the road is still closed for the winter, but you just need to take a left onto route 258 for Strynefjellet. 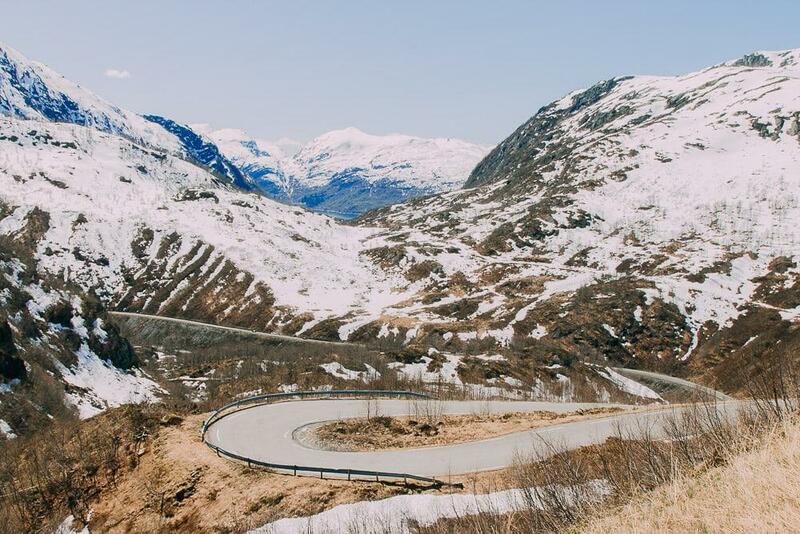 You can read why this road is so amazing here: The One Norwegian Road Trip You HAVE To Take. 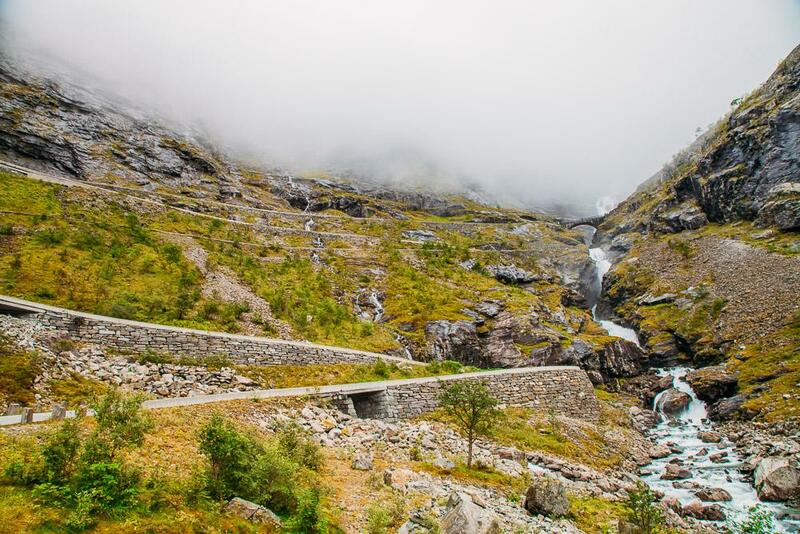 Then you might want to head to Trollstigen, which is famous for its many hairpin turns and incredible views (you can read about the drive to Trollstigen here), or you can head straight to your accommodation for the night to relax on the fjord. 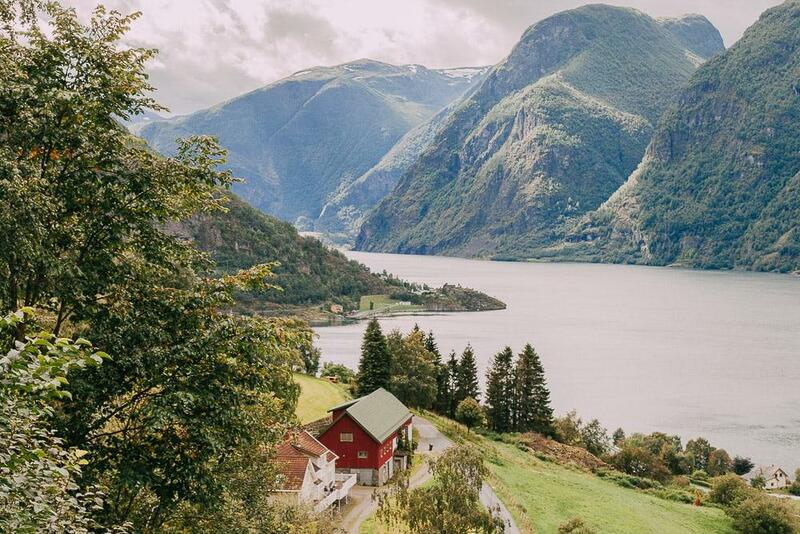 There are a lot of great Airbnb options near Geirangerfjord, like this rustic villa with mountain views, this apartment within walking distance of the fjord, or this beautiful place in Bjorke. You can also take a look through this list of Geirangerfjord accommodation and find something that suits your interest and budget. At this point you’ll need to head back to Oslo if you only have time for a seven-day road trip, but if you have extra time you could go on to Ålesund, and then even up to Norway’s famous Atlantic Road (the one where the road goes over the water in beautiful bends). 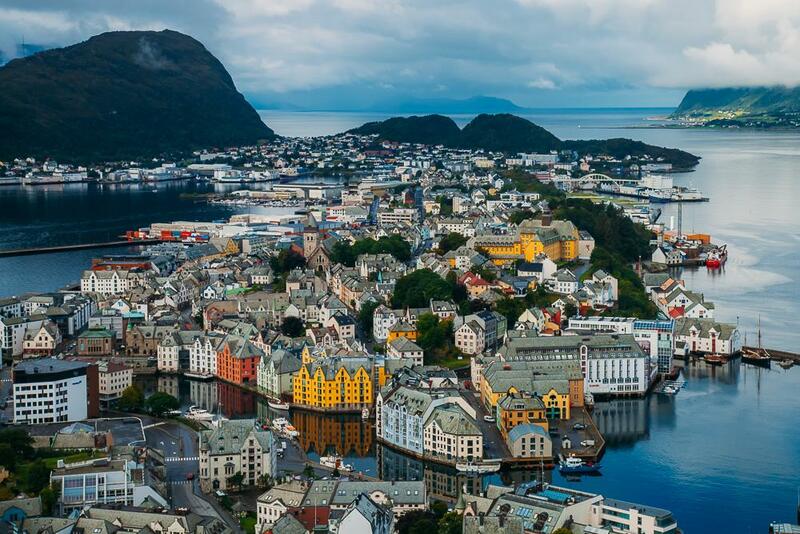 Ålesund is stunning and many Norwegians consider it the most beautiful city in Norway. It’s definitely worth a visit – in fact often when people ask me where to go in Norway if they can only visit one place, I tell them to visit Ålesund. You can read about things to do in Ålesund and the surrounding area here. This is a long last drive and the end bit is quite boring, but it would be a lot more expensive to drop off your rental car in a different location than you got it, so if you don’t want to pay the extra fee you’ll need to get back to Oslo! Otherwise, you can try to drop off your car in Ålesund and fly back to Oslo. If you’re driving in the summer try to take the route through Beitostølen, as it’s the most scenic. 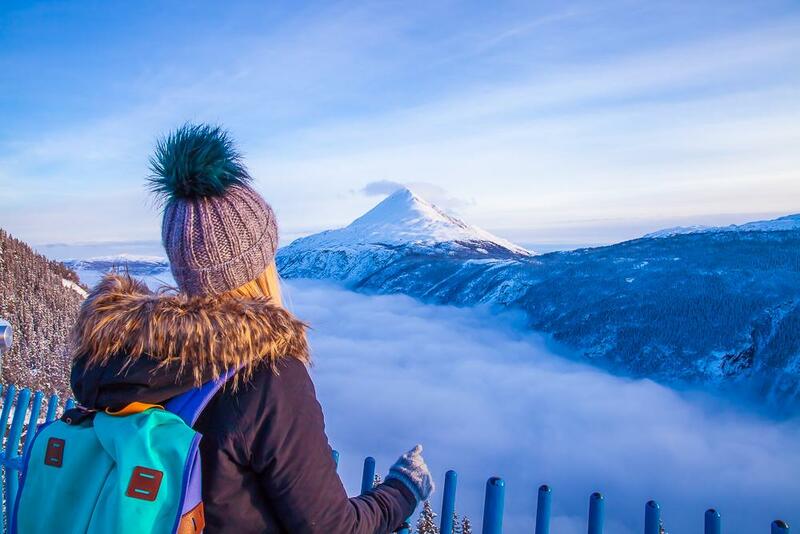 Beitostølen is a famous ski destination and while the town itself is just a ski town, the surround nature and drive are stunning. It’s not showing up on the map now because the road is still closed for the winter, but it’s 431 kilometers and takes about 6 hours and 40 minutes. If you’re planning to stay the night in Oslo, Airbnb also has a lot of great options, like this cozy flat only a 7-minute walk away, this chic downtown studio, or this seaside apartment. You can see more of my recommendations for the best hotels and hostels in Oslo here. 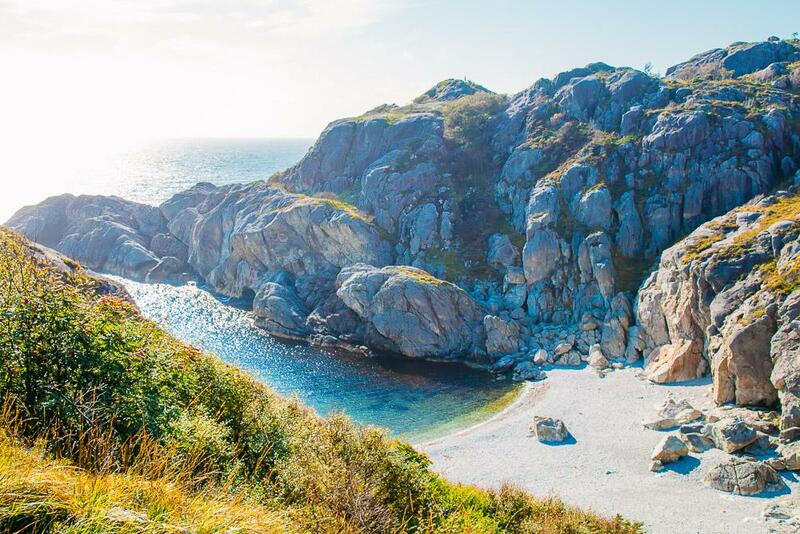 While incredibly popular amongst Norwegians, foreign tourists often aren’t too interested in Norway’s southern coast. In fact, I remember being so excited to take my English boyfriend and his friend to Grimstad and Arendal, but they were totally unimpressed. I think the reason is that the south has really nice weather to Norwegians, but for most foreigners, it’s still fairly cold and they’d much rather see Norway’s famous mountains and fjords than cottages and sailing boats. But there was one area of southern Norway that impressed my English friends – in fact, I’d say it’s one of the nicest parts of all of Norway. And that’s where you’ll be heading this week! If you’re into hiking and amazing landscapes, this itinerary is for you. 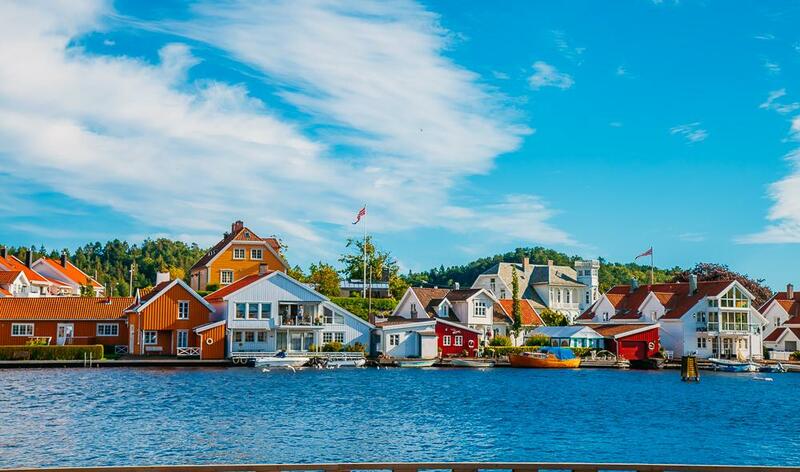 Kristiansand is a favorite amongst Norwegians, especially in the summer. It also makes the perfect starting off point for your trip, as you can either fly here directly or get the train down from Oslo before renting a car here. Mandal is one of my favorite towns in Norway – again, especially in the summer. It’s just so picturesque! Here you’ll find a town center with cobblestone streets, cafés where you can eat outdoors, and colorful wooden houses perched at the edge of the water. It’s so lovely. And then the driving from Flekkefjord to Brufjell in Åna-Sira is amazing. You can read more about Åna-Sira and climbing Brufjell here. The start of this drive has possibly the most epic scenery I’ve seen in all of Norway. Seriously, the mountains here are so unique and simply incredible. Then the road from Ogna to Bore is a National Tourist Road, and it’s worth stopping at the Kvassheim lighthouse and the beautiful Orrestranda beach. I find the last bit into Stavanger sort of depressing as it’s basically the oil suburbs, but then Stavanger itself is a really lovely city worth wandering around – especially in the old town. You could even spend an extra day exploring the old town in Stavanger, and even go sea kayaking around the archipelago. There are also quite a few Airbnb options in Stavanger, like this dreamy seaside apartment, this modern studio downtown, and this beautifully renovated home. 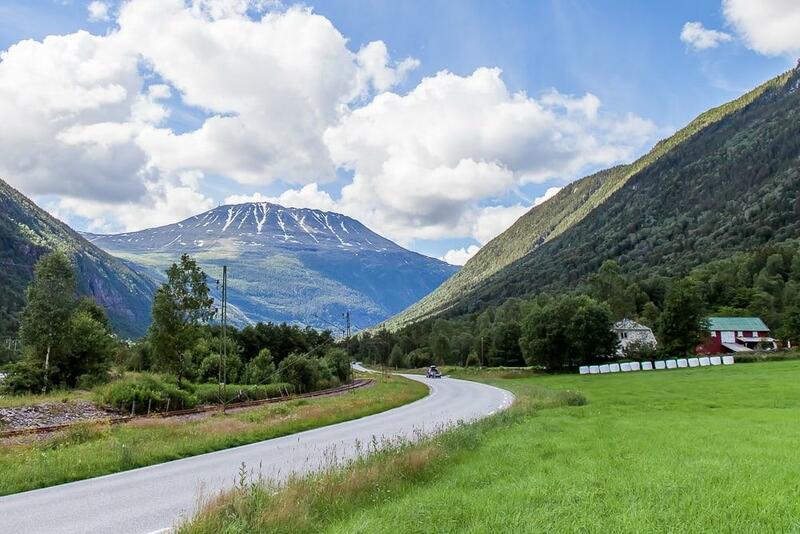 This is one of the most famous drives in all of Norway, and for good reason. You’ll be passing by two of Norway’s most popular hikes, Pulpit Rock (Preikestolen) and Kjeragbolten, and then ending up near Norway’s third most famous hike, Trolltunga, which happens to be near one of Norway’s most beautiful fjords, Hardangerfjord. See below if you want to add an extra day to hike Preikestolen or Kjeragbolten. Odda doesn’t have great accommodation options (plus hotels in town book up really quickly because Trolltunga is such a popular hike), so I’d recommend staying somewhere along Hardangerfjord instead. Optional extra day: hiking Preikestolen, Kjeragbolten, etc. 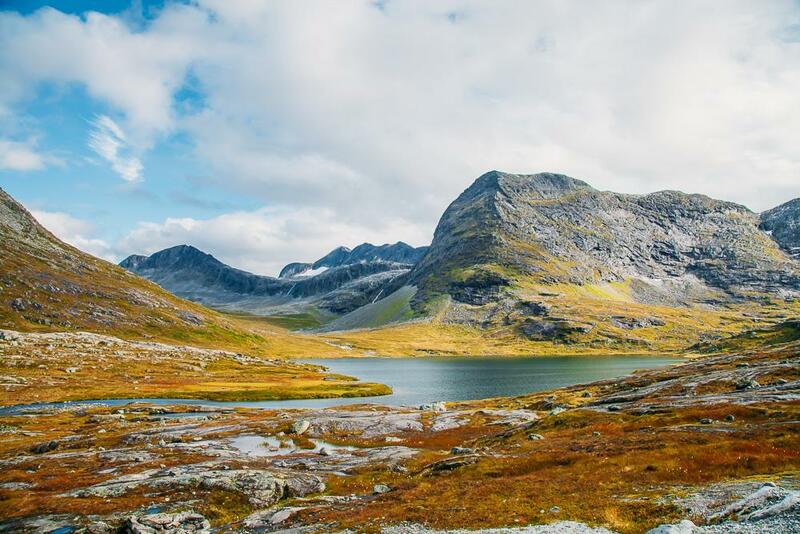 Instead of heading straight to Odda on Day 3, you could instead stay somewhere along the Ryfylke route and do some hiking. The two most famous hikes in the area (and in all of Norway) are Preikestolen, or Pulpit Rock, and Kjeragbolten – the giant boulder wedged between two mountains. Check here for all hiking options to Preikestolen (you can even go on a guided snowshoe hike in the winter!) and check here for all hiking options to Kjeragbolten. 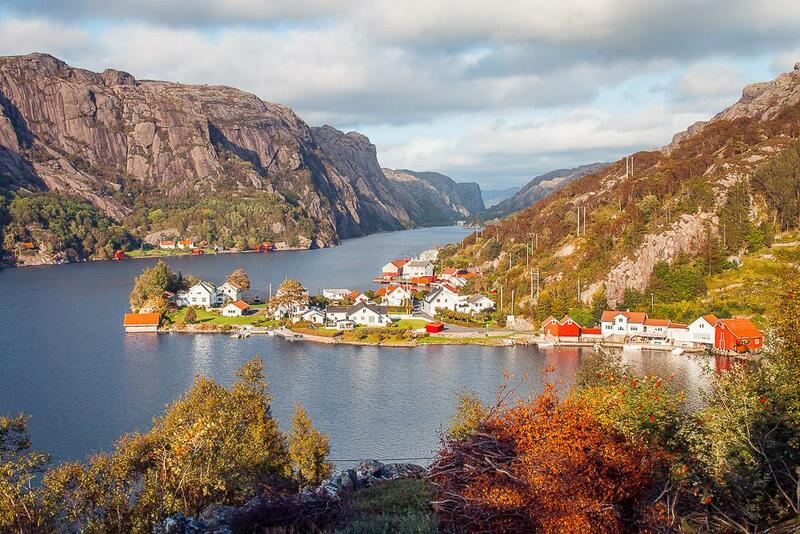 If you want to stay near the hikes, I’d choose Wathne Camping for budget accommodation, Verkshotellet Jørpeland for mid-range accommodation, or Preikestolen fjellstue, right by Pulpit Rock, for luxury accommodation. 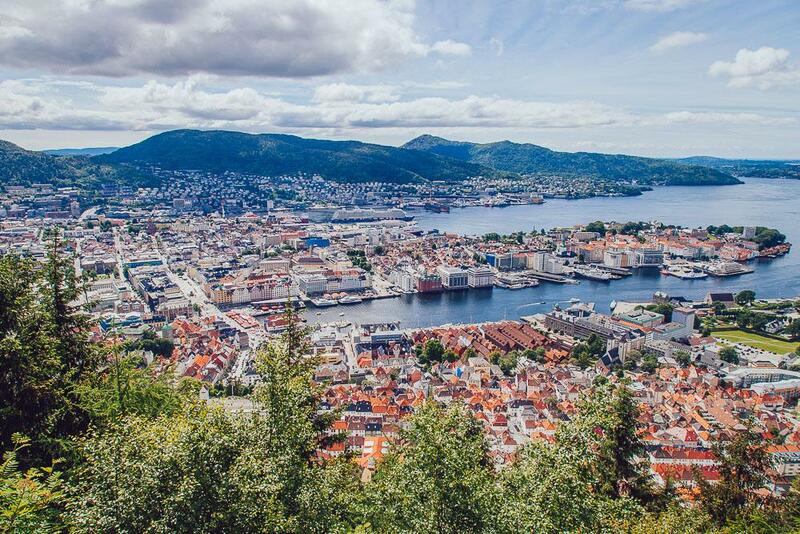 Leave the car in the car park and take the day to explore Bergen! You can find some things to do in Bergen in here. 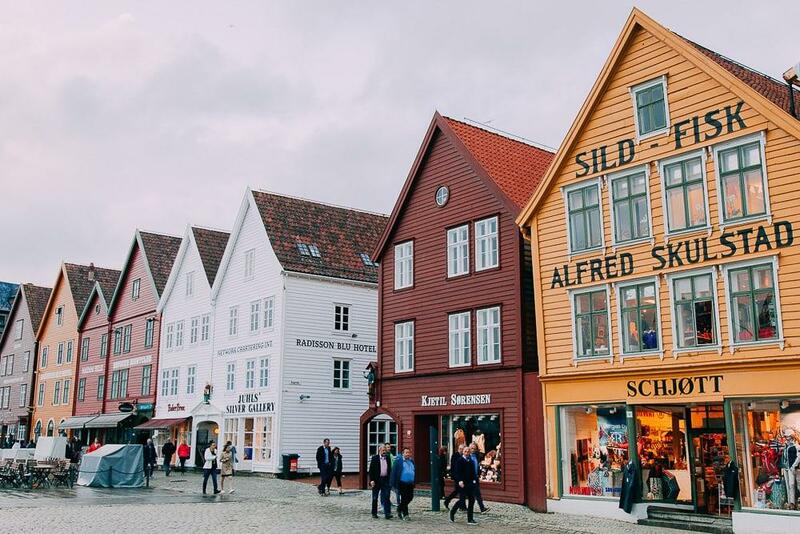 And there are so many tours and activities offered in Bergen – in fact when you see how much you can do here you might just decide to add an extra day to your Norway trip. Check here for tours and activities in Bergen, and check here for adventure activity options (like zip-lining and helicopter tours!). Okay, so the fastest way back to Kristiansand would be to get the highway back down the coast, overnighting in Haugesund or Stavanger. But if you really want to cram as much as you possibly can into your week in Norway, consider taking this longer, but oh so stunning route back to Kristiansand. 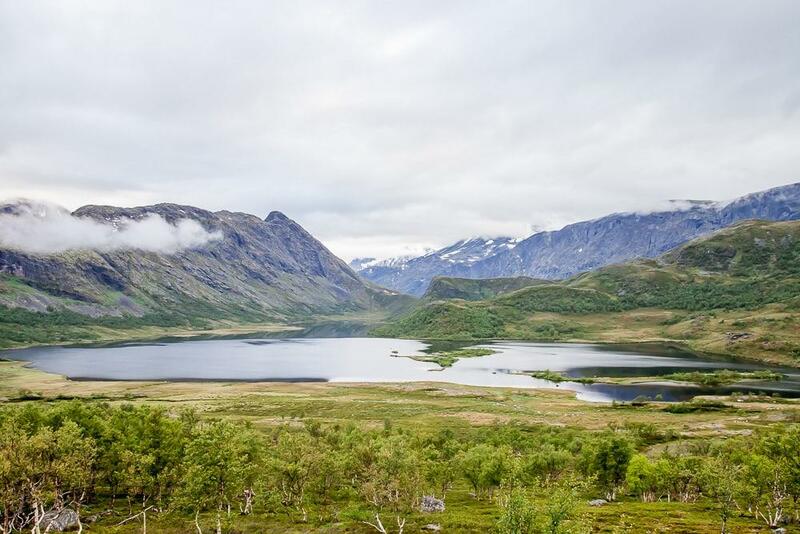 Today you’ll drive from Bergen over Hardangervidda, the largest plateau of its kind in Europe, which also happens to be home to one of the largest wild reindeer herds in the world. Part of this route is also a National Tourist Route in Norway. If you want to split this day into two, you could camp up on Hardangervidda. And then you’ll finish the day in Rjukan, one of my favorite towns in Norway. You can read about Rjukan here. There are also quite a few Airbnb options in Rjukan, such as this idyllic cabin, this charming apartment, and this beautiful chalet. This is another beautiful drive. You’re going to start the hair pinned climb up towards Rauland, passing the Vemork Heavy Water Museum on your left as you’re driving out of town. And then you’ll then drive through Rauland (where I live!) and up the dramatic valley of Dalen down towards Kristiansand. 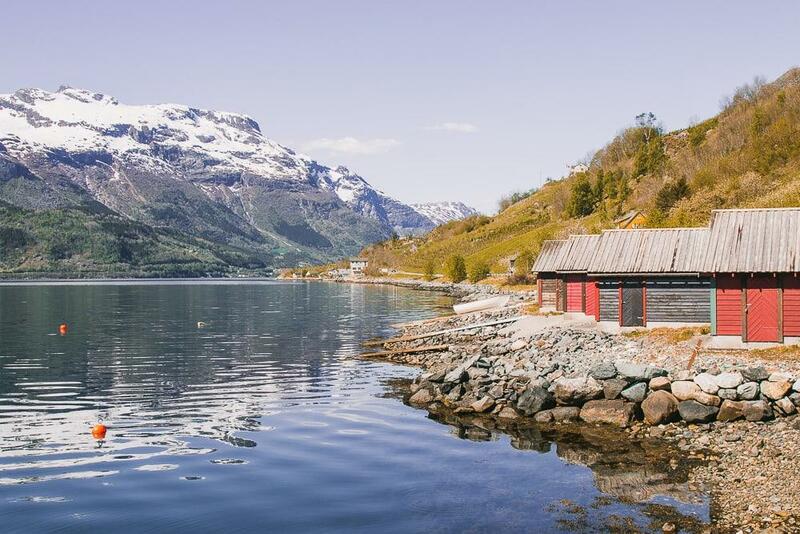 And with this itinerary, you can explore Norway solely by public transport! Of course, if you want more flexibility you could do this route by car instead, with some modifications. The most popular public transport itinerary for people spending a week in Norway is by far getting the train from Oslo to Bergen, then doing Norway in a Nutshell, and returning to Oslo again by train. Norway in a Nutshell is a fine route, but personally I don’t think it shows off Norway’s best sights, but instead just its most convenient ones. This route covers more ground, and personally, I think it would give you a much better introduction to Norway. Today you’ll get the train from Oslo to Røros. Founded in 1644, Røros is one of the oldest towns of wooden buildings in Europe and is a UNESCO World Heritage Site. This old mining town is definitely on the tourist path, but it’s far enough inland that it still doesn’t get as many visitors as the stops along the fjord cruise route. Røros also happens to be my mother’s favorite place in Norway! If you’re into history and cute towns, you’ll love it. There are also Airbnb options in Roros, like this tiny room, this guesthouse, or this apartment. Get the train in the morning so you can have pretty much a full day to explore Trondheim – the first place I lived in Norway! To get started, try booking a customized tour with a local guide. You can check prices and availability here. For more, you can check out my favorite things to do in Trondheim here. You can find plenty of Airbnbs in Trondheim, like this charming flat in Bakklandet, this beautiful apartment near the centre, or this huge place only 10 minutes from the train/bus station. You can find a list of the best hotels and hostels in Trondheim here. Today you’ll either get the coastal express ferry from Trondheim to Kristiansund, which takes about 3.5 hours, or the Hurtigruten, which takes 6.5 hours. Coastal express tickets cost 648 NOK and the Hurtigruten costs 533. And you don’t need to book the tickets in advance – you can just buy them on board with either cash or card. Personally, I’d prefer to save time and take the express ferry, especially as while the Hurtigruten will be full of tourists, the coastal express is primarily used as a commuter service, so you’re unlikely to see any other tourists on board. But the schedule is a bit strange depending on what day you’re leaving, so you might have to get the Hurtigruten instead. You can find the coastal express schedule here and the Hurtigruten here (you’ll need to translate it with Google). Then take the afternoon/evening to explore Kristiansund! Today you’ll get Bus 100 from Kristiansund to Ålesund (Kristiansund trafikkterminal platform 2 to Rådhuset i Ålesund). The journey takes just under four hours and goes through some beautiful landscapes. The first time I visited Ålesund, I stayed at this Airbnb, which was cheaper than a hostel, plus it had a kitchen so I didn’t have to pay for eating out (one of the biggest expenses when traveling in Norway). If that’s booked check other Airbnb options, like this private flat, this bright, top floor apartment, or this retro camper. Take the day to explore Ålesund and the surrounding area. You can find a guide to things to do in Ålesund here. You could also take a fjord cruise/bus into Geirangerfjord, one of Norway’s most beautiful fjords, or even go kayaking through the fjord! Today you’ll take bus 681 to Åndalsnes – you can simply buy tickets on board the bus. 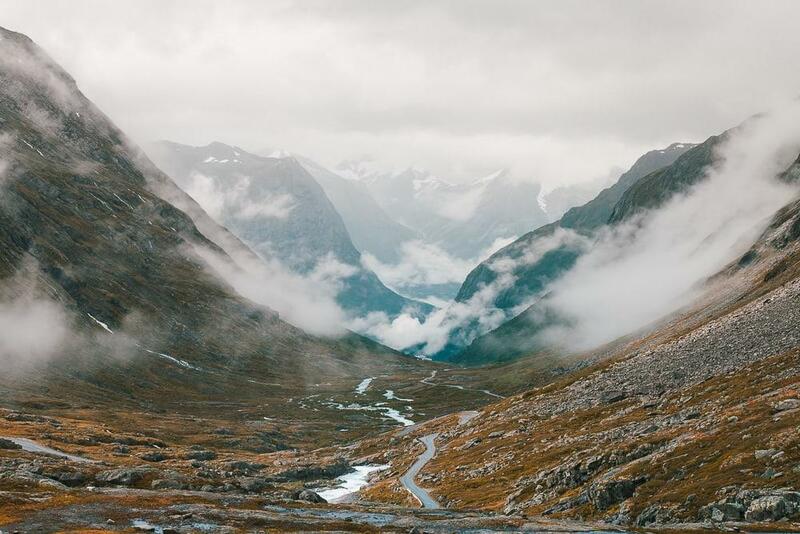 And then from Åndalsnes you can get the bus to Trollstigen or, if possible, I would actually recommend renting a car for the day to drive to Trollstigen and the surrounding area, as there are some great places to explore here. You could also book a tour, check rates and availability here. Today you can just relax on the train back to Oslo. Be sure to book your train tickets as far in advance as possible (up to 3 months), as the tickets will be much cheaper, starting at just 249 kroner. There are a lot of Airbnb options in Oslo, like this cozy flat only a 7-minute walk away, this chic downtown studio, or this seaside apartment. You can see more of my recommendations for the best hotels and hostels in Oslo here. Lots of airlines fly into Oslo, so you shouldn’t have a problem finding good flights. And if you’re on a budget you’re in luck – Norwegian is a budget airline with some of the cheapest connections between the US and Europe. I fly them all the time, just remember that it is a budget airline so you’ll have to pay extra for checked luggage, meals on board, and even water during your flight. I always bring several sandwiches and lots of snacks and a big water bottle that I refill at the airport (after security of course!) to tide me over. Just be sure not to exceed the carry on luggage limit if you don’t pay for checked luggage with Norwegian, because they are super strict. My friend recently flew Norwegian to visit me in Norway and she had to pay $200 to check her bag at the airport. Not so budget! I do love Norwegian, but sometimes you can find even better deals with other airlines, and if you do it’s definitely nicer to fly a non-budget airline. Luggage fees add up and it’s so much nicer to fly an airline with meals and drinks included. My go-to for finding flights are Skyscanner and Kiwi.com. Kiwi.com especially is a sneaky travel hack tool that can find great connections that other search engines don’t include – I’ve written more about Kiwi.com and how to use it here. You’ll probably be flying into and out of Oslo Gardermoen Airport which seriously is one of the nicest airports in the world. And guys, I travel for a living so I spend a lot of time in airports. Pro tip #1: if you want to look like a local, head straight to the Tax Free shop once you land. It’s always funny getting off flights in Oslo because every Norwegian will go straight to Tax Free to buy alcohol, and it’s only the tourists that skip it, haha. But seriously, if you do want to drink in Norway and are on a budget, you’ll save a lot of money by picking up something here. Pro tip #2: Don’t get the Flytoget, or Airport Express Train, into Oslo from the Airport. It’s only three minutes faster than the regional train and costs twice as much! Again, it’s only ever tourists who get the express (“express”) train while all Norwegians get the NSB train. You’ll see the red NSB ticket machines on your right once you exit customs and you can buy your tickets there. You can also check the train schedule at nsb.no. The most important thing about packing for Norway is to bring lots of layers. The weather here is really unpredictable so it’s important to be ready for lots of different temperatures throughout the day. I’ve written a complete guide for what to pack for winter in Norway here, and a guide to what to pack for summer in Norway here. I really want to take you up on your suggestions and skip most the cities. Most your itineraries include Oslo. Any recommendations on a 7 day trip flying into Bergen or Aselund. My wife and I, always happy skipping some of the more crowded hikes and dense tourist areas. We could only do a late May trip. You wrote a great post on Hardangerfjord, but it made us worried we should postpone Norway until a September trip was better for us. My family and I have about a week to travel from Oslo to Bergen. This will be in mid April. Our goal is to take our time and stay in a couple small towns and see natural beauty (and Norwegian culture!). My research (and your blog) indicates that this whole area is great and it’s hard to go wrong. What would be your suggestion on the best route this time of year? Thanks so much! Thanks for the great post. My family of four will have a one week stopover this June in Norway en route from Doha to Seattle. My ancestors come from around Bergen and it’s always been a dream to visit the Stolen family. My kids will be 3 and 5 at the time. 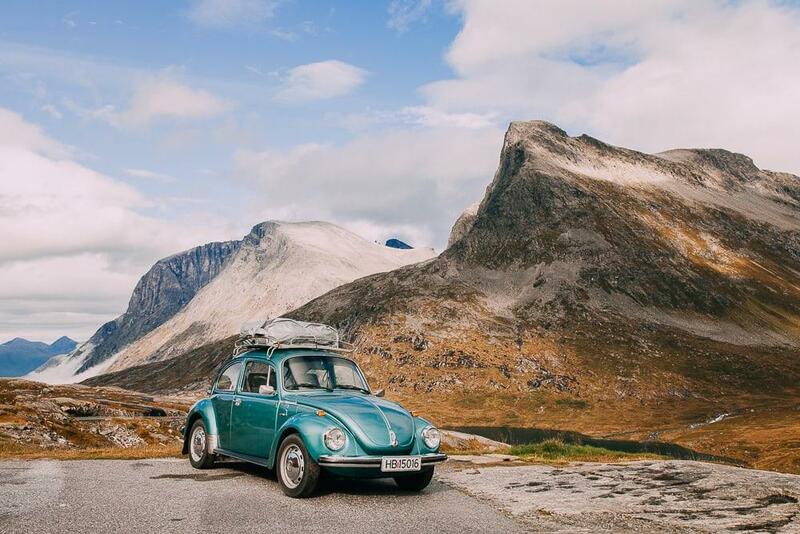 They do not do too great on long road trips, but we definitely want to see the country and get to Bergen. We love the outdoors and are an adventurous family (traveled Albania, 30 days on camino del norte, Nepal, Sri Lanka, Turkey…). What would you recommend for a 6 day journey, getting to Bergen and getting outdoors? Are there perhaps two good spots where we can spend 3 nights in each? This is very helpful. We plan to take summer trip next year and believe we use one of the route. Thank you so much for put together these useful information. Thank you for the really good tips and details. We are planning to visit Oslo in 2nd week of November for 3 nights.Initially we wanted to plan the train trip to Bergen and go for cruise explore nature but given its going to be winters maybe its better to decide once there. Can you suggest if its okay at least for the city break in November if not nature trip? And do you have any suggestions to make the best out of our visit in such weather? Appreciate all your help on this. We are a family of five (two parents and three young adult “kids”) and interested in visiting Norway, especially since my paternal grandfather, Richard Grimsrud, was Norwegian. Here’s the thing; we really prefer to stay in one place if possible, and to minimize our car time. We prefer to stay in a very small town or village where we can walk and swim (assuming it gets warm enough to swim in Norway!) and shop and eat at cute cafes and restaurants and get places mostly on foot. Is there any picturesque place that comes to mind that might be good for us? We hope to come from Boston in the summer. We also are really interested in culture and history. So appreciate hearing your thoughts! This is just amazing Silvia , Great blog ! I really hope I have enough time to book and plan the trip accordoing To your itinerary at least for public transport route. 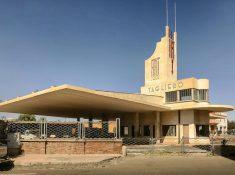 Currently I have already booked the usual tour and visiting the tourist crowded hike and towns in this August . Hopefully I could revisit The beautiful Norway another time !